We pray that tonight would be encouraging for you. If you're a guest here with us, we invite you to fill out our communication card in our app or at the Next Steps table in the back of the auditorium after service, we'd love to meet you and we have a free gift for you. Click the link below to see THE WEEKLY - our digital announcements/info for all things happening in and around Elements...or find it in our app. Jesus accomplished WAY more than you and I can every imagine! What Jesus did on the cross changed everything for anyone willing to trust in Him through faith. When He declared: "it is finished" - he declared something that no one can undo or no one ever needs to redo. It is finished. 3 simple words that hold a world of meaning. 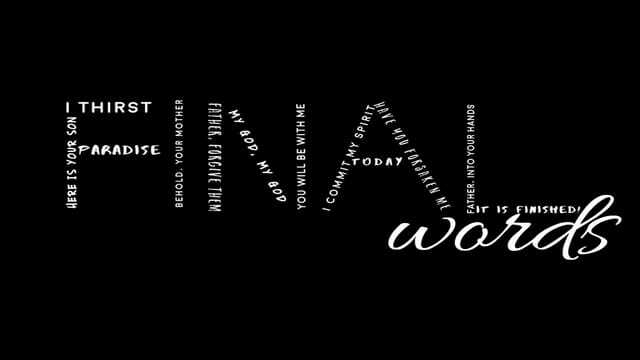 Notice, Jesus doesn't say "I am finished." So, what was accomplished? – the fundamental issue of the cross was way more than just an example of sacrifice and what a good leader would do. The cross was addressing the issue of sin, the penalty and consequences of sin upon the human condition in regards to a relationship with a perfect, holy God. – ‘missing the mark’ – an archery term. Meaning God has established (because He’s the creator and sets the reality as he sees fit) the mark for us to hit. He’s perfect and calls us to be perfect. But we all miss the mark. Jesus captured it in one word! : “Tetelestai” = "It Is Finished". The cross at it’s very core – is that the issue of sin was addressed by the death of Christ as he fulfilled his mission. Jesus wrote the check to pay our debt – and His resurrection verifies the check cleared! Life with God is available through faith in what Jesus accomplished! Tetelestai = It Is Finished. This is a victory cry – He accomplished what he was sent to finish! We no longer have to figure out ways to try to pay our debt of sin…or work our way to God --- God came to us, on a rescue mission for us! Buddha's dying words were, "Strive without ceasing." Jesus' were, "It is finished." On the cross God took the penalty, so he could still love the sinner, while paying for the sin, in order to satisfy his wrath, so he could express his love, without compromising his perfection! It is finished" was not a death gurgle. "It is finished" is not "I am done for." "It is finished" is a cry of victory. the cross, the ultimate symbol of defeat = got flipped that day and is now the ultimate symbol of God’s victory! When Jesus Christ dies and the veil is ripped, not from bottom to top, but from top to bottom. Jesus opens the way for us to have relationship with God, through faith in Him! That’s the gospel = Jesus made a way, when we had no chance to find a way back to God. NEED PRAYER? ....we've got some of our prayer team and pastors available following service to pray with you. Or you can text the word "prayer" to our phone number: #520-300-9001 to submit your prayer request or submit one via our new app. We look forward to partnering with you in prayer. Every gift you give enables us to move the mission of Elements and the Hope and Light of Jesus forward in our city and beyond. Thank you for financially faithfully partnering with us! You can give here or easily within our free app on your phone or tablet.